MicroStreaming is a form of live production which can eliminate post production requirements yet still provide valuable marketing videos with real production value. PTZOptics has pioneered this new technique and has now released a free video series (below) & eBook introducing the main topics of interest. In this article we will discuss the business drivers for the creation of high quality video content and how MicroStreaming.io is becoming a preferred workflow with today latest live production software. When Salesforce.com published the above statistic describing the business value for video views and sales personnel time valuation; we knew things were going to change. Everything from on-demand video content to live streaming webinars on-demand content is becoming a central focus for advertising and marketing initiatives in businesses of all sizes. The entire industry is embracing video for the simple reasons stated above. Customers are researching online for the majority of their decision making process. One recent study on Slideshare.net unveiled that 90% of customer research time is spent online before a sales representative was contacted. Both consumer and B2B purchasing decisions are being influenced by on-demand video. Whether you decide to leverage YouTube’s dominance in the video search arena or simply want to add a series of videos to your existing website MicroStreaming is a great DIY solution. PTZOptics “MicroStreaming” approach pulls from effective sales principles and applies live streaming technologies to a new innovative workflow. “Using a green screen with virtual sets allows marketing teams the ability to place their next video anywhere in the world! We seemlessly switch between various scenes to make our videos more powerful” says Paul Richards Dir of Business Development at PTZOptics. “So many customers have asked how we make our marketing videos that we decided to create a complete YouTube Series on the subject and coin the process MicroStreaming”. Learn how to deliver a hook, line and sinker during a MicroStream and you’ll be amazed how effective video marketing can become. Microstreaming is a new way of producing content live without the need for post production. We teach you how to create top notch marketing videos that will generate leads for your company without the need of expensive video equipment and timely post production. Or get up to speed quick with the below video series! The NewTek ™ NDI (Network Device Interface) is a open source IP protocol for sending and receiving ultra low latency, high definition video and audio sources for live broadcasts. The protocol has been pioneered by Dr. Andrew Cross, NewTek’s president and CTO, to become a new standard for the industry. What does this mean for NewTek and the popular TriCasters? TriCasters will now have the capability of working with any NDI compatible device and provide low-latency HD video functionality. Device manufactures can now implement the NDI open source code for seemless integration into a NewTek TriCaster broadcast workflow. What does this mean for the live streaming market? The live streaming market is set to grow signifigantly in the coming years. Open source technology is a proven way to spur growth and market engagement. The NewTek NDI allows for ultra low latency connections between multiple systems. Therefore various systems can now share resources over a local area network. A TriCaster Mini system can share video and audio sources with a NewTek TriCaster 460 allowing for flexible deployments for any budget. In the below example we are showing a NewTek TriCaster with various HD-SDI PTZOptics cameras connected. This Tricaster is then connected via NDI to a TriCaster Mini with additional PTZOptics HD-SDI cameras available as video sources. I’m happy to finally announce our secret YouTube live streaming formula you can use to create amazing video content about any subject! This “secret” broadcast technique is a combination of simple video flow management and live streaming technology such as: Green Screen/Chroma Key, Video Conferencing and Live Video Production. The approach is simple: Hook, Line and Sinker. You can add as much branding and special effects as you want but the principle hook, line and sinker will always reign supreme. 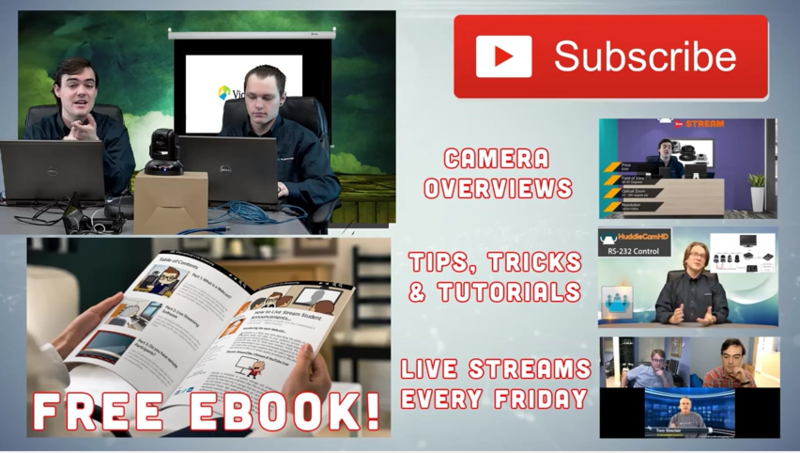 In this eBook we will review how various Virtual Sets, Video Overlays and Lower Thirds branding can help bring your videos to life like the pros. Live streaming is the next big thing in production. It not only excites YouTube producers and Twitch gamers but also news channels and event managers. All big events are now live streamed to billions of users worldwide. It has become part of the ever growing network on the internet and continues to grow by a massive percent every year. Update: September 2017 - Wirecast and vMix have both recently released huge updates to their live streaming software. The following blog post has been updated to include Wirecast 8 and vMix 20.